A single storey, 17th Century Farm Cottage sitting right in open moorland with uninterrupted views over stunning countryside. Wild animals will come right up to your lounge and kitchen windows! The cottage has two bedrooms, one double and one twin, one bathroom with bath and shower fitting, a large, fully fitted pine-fitted kitchen with all mod-cons including a dishwasher, and a comfortable living room, with dining furniture, leather sofas, log burning stove and TV/Free-view & DVD. Wi-Fi access is included. A basket of logs is provided, to keep you really cosy on those winter nights. A private barbecue is also provided so you can enjoy the warm Cornish sun. Five delightful Cornish cottages on the edge of Bodmin Moor yet ideally located to reach any part of Cornwall. On the doorstep is uninterrupted countryside views, officially designated as an Area of Outstanding Natural Beauty, and yet close to the coast - best of both worlds. Moorland ponies, sheep and cattle are your neighbours which graze on the adjacent Bodmin Moor. Three of the cottages retain many of their original features, such as the traditional Cornish stone walls and exposed beams. Delphy and Barn Cottage, whilst newly built maintain character with the benefits of modern design. Recently under new management, all the cottages have gone through a period of refurbishment so whilst being full of character, they are also full of comfort. Situated on a former working farm and set in 5 acres of private land, guests are welcome to explore the property as they wish. There's just so much to do and we hope that our enthusiasm for what this part of the country has to offer will come across to you here! The riding stables adjacent to us, provide hacks during the popular months of the year. Riding out on the moor from your cottage is just fantastic. Bodmin Moor is also fantastic for walking and hiking, with Rough Tor and Brown Willy (the two highest points in Cornwall ) viewable from Ladydown Moor. Explore the tors, streams and stone circles in this fascinating Area of Outstanding Natural Beauty. The Camel Trail is one of Cornwall's best known attractions and is a cycle path that runs for about 26 miles along a disused railway track and the Camel Estuary. It runs from Padstow up onto the Moor, passing through the town of Wadebridge , and covers some of the most stunning scenery you're likely to encounter in this country. The track is level and even the youngest child can enjoy the day out. The Camel Trail is just a short distance from your cottage. Bring your own bikes, or alternatively, we can recommend various bike hire companies along the Camel trail. It is also possible for you to arrange for bikes to be delivered to your cottage if necessary. There are some fantastic beaches just a short drive away from Hallagenna Cottages which cater for all tastes of beach activity. The North Coast beaches are rugged and wild, with huge stretches of soft sand, rocky outcrops, cliffs and caves, and great surf for body boarders or surfers. It's easy to catch fishing boats, speedboats and short boat trips from places like Padstow and Rock. There are nine golf courses within driving distance from your cottage. Bowood Park in Camelford,is very close by and is highly recommended, also St Enodoc Golf Club offers a mature golf course with stunning views out to sea. Contact details of many more courses are supplied within the cottages. Cornwall is steeped in history with it's ancient settlements, stone circles, monuments, old tin mines and castles. It's varied scenery has been used as stunning backdrops for film locations and inspiration for novels. Cornwall retains many of its original fishing villages, including Port Isaac, which is set in the side of a hill and recently used as the setting for the TV series 'Doc Martin'. You can wander around the quaint narrow streets, leading up to the clliff side walk where you can view the stunning Atlantic Ocean. There are many other fishing villages on both the North and South Coast, including Boscastle, Charlestown , Mevagissey, Fowey & Padstow. It has brought millions of pounds of industry to Cornwall and is still growing in size and reputation. It's a very short drive from your cottage, about 1/2 hour, and is well worth a visit. We had a lovely stay at Ladydown Cottage, very peaceful and the cottage was equipped with everything we could need. Wonderful views of the moor and our two year old loved watching the sheep, cows and ponies from our window. Great location allowing us to explore beautiful Cornwall. Would definitely like to return. We are a retired couple with a dog and we enjoyed our stay very much. Ladydown cotttage is an L shaped bungalow that appears to be a barn-conversion set in the corner of the neat and tidy stable yard. It has a small enclosed courtyard garden of its own. The property is right on the edge of Bodmin Moor - the cattle grid onto the Moor is almost outside so there is a rumble when a car goes over. Our dog startled at the noise at first but soon grew used to it - and the traffic isn’t very frequent. The window in the living room looks onto the moor and sometimes the sheep came right up to the window. Our dog paid no attention but it’s something you would need to bear in mind if you had a dog who reacted to livestock (cattle and ponies as well as sheep are on the moor.) There are several other cottages in the yard, but Ladydown is very private. The cottage is clean and attractively decorated. It has comfortable beds, a good shower and a well-equipped kitchen - even a dog’s water bowl! Wi-fi reception is a bit patchy but then it is a remote location. 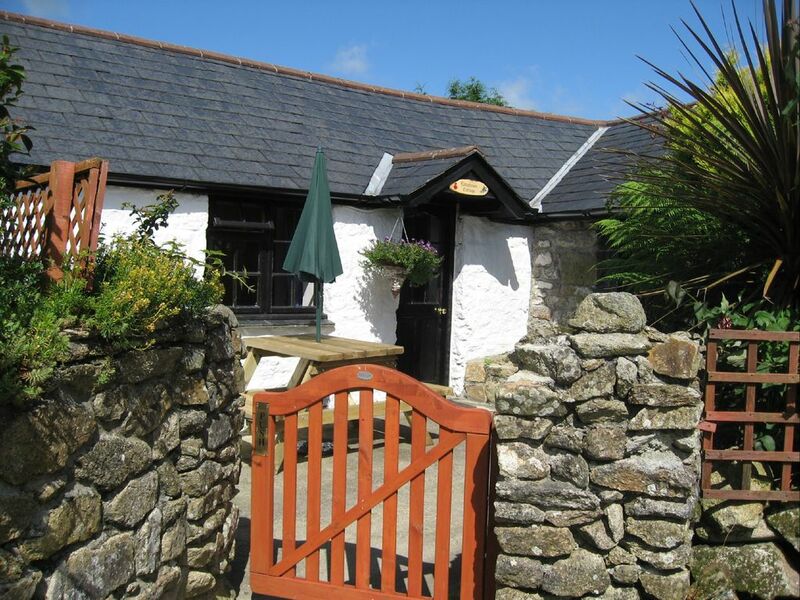 The cottage is a good base for walks on the moor as well as drives to both north and south coasts. The centre of the village, with shop and pub, is about a ten minute walk or very short drive. A fabulous fly-drive base, the cottages are centrally located and situated in uninterrupted countryside officially designated by the World Heritage Organisation as An Area of Outstanding Natural Beauty. Open Moorland with wild horses is the view from your windows and yet the closest beaches are just a short drive away (Rock, Polzeath, Trebarwith Strand). Only a half mile stroll from the village of St Breward where you will find a village stores, post office and an Olde Worlde 11th century pub with roaring log fires and a Les Routiers Restaurant. A few minutes away from the Camel Trail which runs from the Moor to Padstow, you can hire bikes locally, which will give you a great day out. Just 4 miles from the main A30, both north and south coasts are easily accessible, as are Cornwalls many other varied attractions. Wadebridge is just 7 miles away if you would like a more cosmopolitan experience and is well served by all sorts of boutiques and supermarket. Please contact the owners for further information regarding dates outside of the normal change-over days and short breaks during the low season. Well behaved dogs are welcome, maximum two dogs per cottage (£20 per dog per week). Unfortunately, HomeAway are unable to include the tariff for dog guests in their booking system, therefore the owners will request this separately.